Because of the school weather cancellation this past Tuesday, the HS rescheduled conferences that were to be held that night to a week later, pushing it on our original banquet date of Tuesday, March 26th. Last Friday, this letter ( Banquet Letter 2013 ) was sent home with your wrestler. (Hopefully it was shared with you!) The rescheduled Goodhue HS Wrestling Banquet is Tuesday, April 2nd at 7:00 p.m. The location is still the same: Holy Trinity Church. The letter provides the potluck meal assignments based on the age of your wrestler. We hope you’ll join us to recognize the growth and accomplishments of our 7-12 wrestlers in this 2012-2013 season. The 7-12 season has quieted down, and the K-6 program is closing in on its final weeks. For those that are interested, Goodhue Wrestling offers a spring wrestling program for those that are looking to pick up more mat time. This year the program is again coached by Kyle Huneke, a former Goodhue standout and current Kasson-Mantorville assistant coach. The emphasis is on traditional folkstyle technique, but a few nights may specialize in Freestyle and Greco-Roman technique. Also, Coach Huneke is available to help coach those that are interested in wrestling at a few tournaments this spring. The schedule this year has some later times due to Gym #1 availability. However, in the coming weeks when the times move down to 7:00 p.m. and the youth season finishes up, we hope to see some younger faces in there to wrestle before it’s time for bed! Also, the calendar view of the schedule is available here on the website if you wish to print out a monthly calendar version. If you have any questions, please contact Coach Huneke or Coach Grant. School on Tuesday, March 19 was closed due to the weather. The parent-teacher conferences that were to take place that night were also canceled. The school today announced that they have rescheduled the conferences for March 26, the night of our banquet. So we are looking at rescheduling the banquet to the following week. I’ll post again when we have a confirmed date to replace the evening of Tuesday, March 26. The Goodhue Elementary Program enters into its competitive post-season action as a team this Sunday in Eyota, MN. The team hopes to place high enough this March 17th in its quest to qualify for the NYWA State Team Tournament for the second year in as many attempts. Last year the team placed 3rd in Region 1 and 10th at the State Tournament. Best of luck this St. Patrick’s Day to our young Goodhue wrestlers! The Goodhue Wrestling HS Program will host its 3rd Annual Awards and Recognition Banquet on Tuesday, March 26th. Details will be coming out soon. However, this year the banquet will take place at the Holy Trinity Church, which is across the street from GHS. The event will start at 7 p.m. Remember to mark your calendars as we hope all can attend! The final round at the 2013 MSHSL State Wrestling Tournament has come and gone. 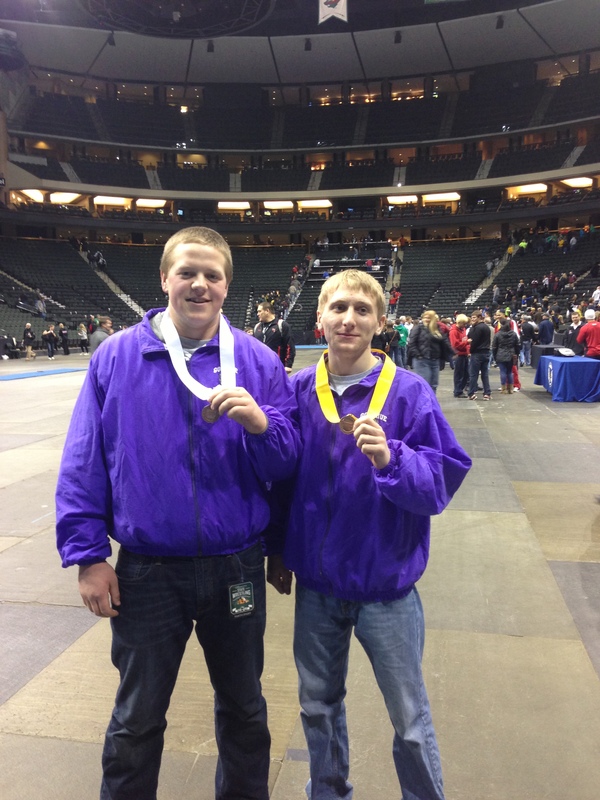 The two remaining wrestlers, Ryan Tipcke and Kyle Drehmel, finished up a great season at the Xcel Energy Center Saturday evening. At 126 pounds, Kyle Drehmel wrestled for 3rd place against Tyler Keller of Medford. Keller scored first on a low single leg, and led into the second period with a 2-1 advantage. Kyle scored reversal points after starting down, but Keller got away to tie it at 3 all going into the final period. With his turn to start down, Keller got away and added a takedown. Kyle quickly got away, but couldn’t finish his own takedown as time expired, dropping the match 6-4. 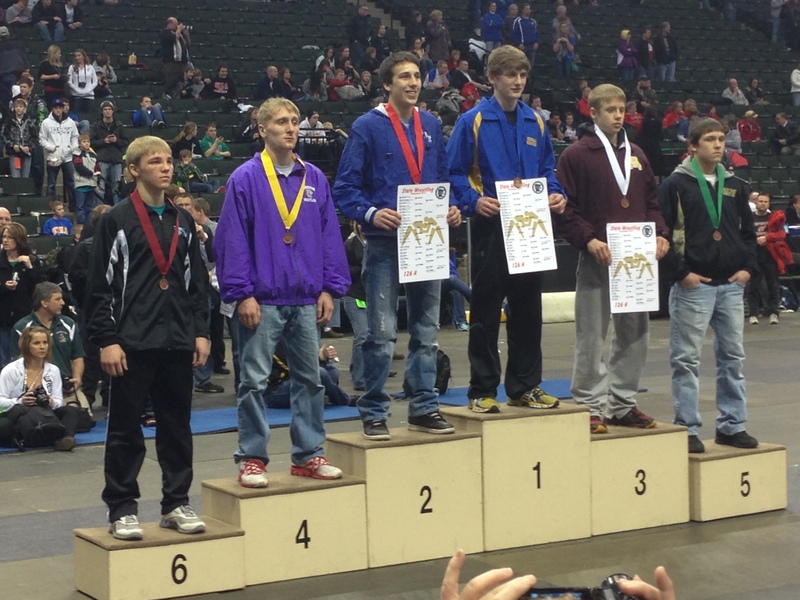 Kyle Drehmel finished his career as the 2013 Class A 4th place finisher at 126 pounds! With a 38-8 season record, Kyle finished his career with 147 career wins, leaving him at 5th place on Goodhue’s career wins list! (See all-time career win list under the “History” link and click on “75+ Career Wins”.) 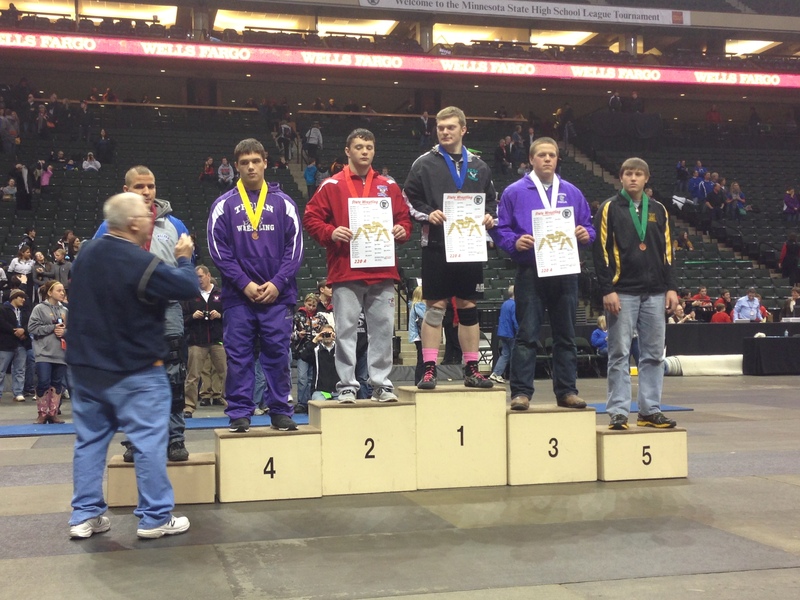 Congratulations Kyle on an outstanding career with Goodhue Wrestling! Ryan Tipcke competed in his final career match on Saturday evening as well. At 220 pounds, Ryan showed his balance and stamina against his big opponents. After a scoreless first period against Kyle Johnson of Barnesville, Ryan scored quickly off the mat with a one point escape. Aggressively looking for the takedown, Ryan picked up a second point in the period on a second stalling call. Still staying aggressive in the third period, Ryan’s opponent got away from underneath but couldn’t score a takedown, leaving Ryan getting his hand raised by the referee in his final match at the Xcel Energy Center. Ryan finished his senior season with a record of 38-9. Ryan Tipcke finished in 3rd Place at the 2013 State Wrestling Tournament at 220 pounds! Scoring the individual state tournament, Goodhue posted 30 team points to finish in 19th place out of 57 teams that scored at least one team point. Ryan and Kyle are your 2013 State Medalists! 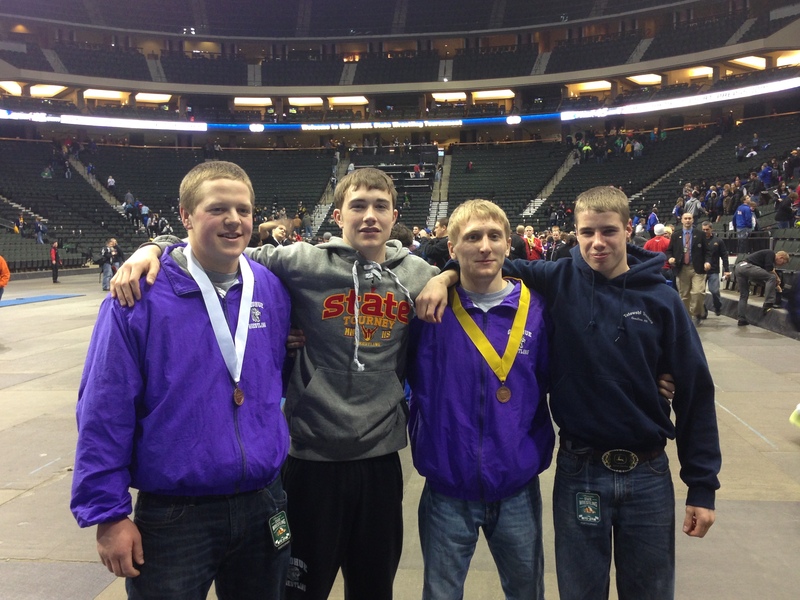 Congratulations on a great State Wrestling Tournament! In his match, Kyle and his Windom/Mountain Lake traded escapes by the end of regulation. Back to overtime, this time Kyle got the takedown in the first OT, launching the senior into the final match of his career. Kyle will contend for a 3rd place finish! Ryan is also a 3rd place contender for his final career! Mysteriously, his opponent decided not to wrestle and injury defaulted to Ryan. Kyle faces a athlete from Medford, and Ryan a wrestler hailing from Barnesville. They will wrestle in the upcoming 5:00 p.m. session. The butcher shop is open! Sweet shot from Brian Deneen here of Ryan in on his signature move, about to pin in Friday’s first round opener.